The present government is talking about the digital or IT use and they are preparing to do everything through the IT or Digitization. Keeping this in mind the ABSU and other Bodoland Movement group in Assam has launched their E- movement for Bodoland . 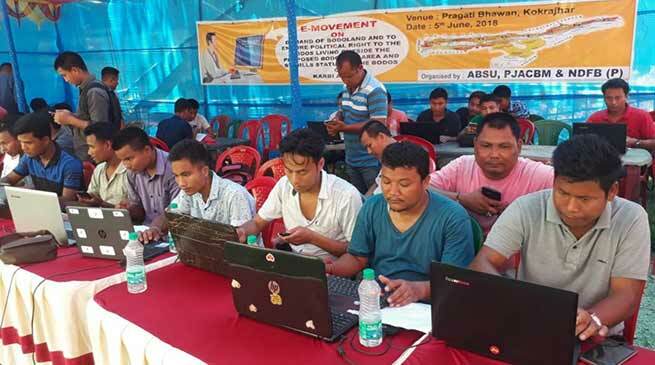 The one month long e-movement launched on 5th June, 2018 for which the movement group has setup temporary camp in all district head quarter and Bodo dominated areas. Dozens of computer with internet facilities has been provided in this temporary camp. The locals, student and general people visiting the camps, writing his or her demand for Bodoland and sending to Prime Minister, Chief Minister, Hone Minister, Political Parties, Political leaders, Media Houses etc. through Mail or by App. Demanding tripartite talk at political level and permanent solution to Bodoland issue. Ensure the political rights of the Bodos living in Assam outside proposed Bodoland and immediately grant ST status to Bodos in Karbi Anglong. Talking to Northeast India24 , the All Bodo Student’s Union President, Promod Boro said that ‘the E-Movement is the Movement for Bodoland Demand and is the call of the time, because we are experiencing the shifting of the government activities and mind set of the political leaders and people as a whole’. ” We urge upon the Government of India to Resolve the longstanding demand for creating Bodoland state at an early date, Hold the political level tripartite dialogue to resolve the Bodoland Issue, Ensure the Political Rights of the Bodos living in Assam outside proposed Bodoland, Grant Schedule Tribe Hills [S.T. (H)] status to the Bodos living in Karbi Anglong in Assam” but their is not any fruitfull initiative from the govt on the above issues or our above demands. Hence we are compel to go to the path of agitation, he added. It must be mention here that ” the Bodo people on 26th April, have organised the “BETRAYAL DAY as well as BLACK DAY” of Bodoland Movement, to show their regret with the Government by shaving their hairs and putting Black Badge in their shirt. They also hold a 4 days National Highway blockade at different places of proposed Bodoland area from 2nd to 5th May 2018. Now the movement group again threatens for Indefinite Hunger Strike, 36 Hours Chakka Bandh, and Railway Blockade etc.